Tuesday is New Release day over at Bugaboo.. Check out the design teams creations over at Catch the bug.. 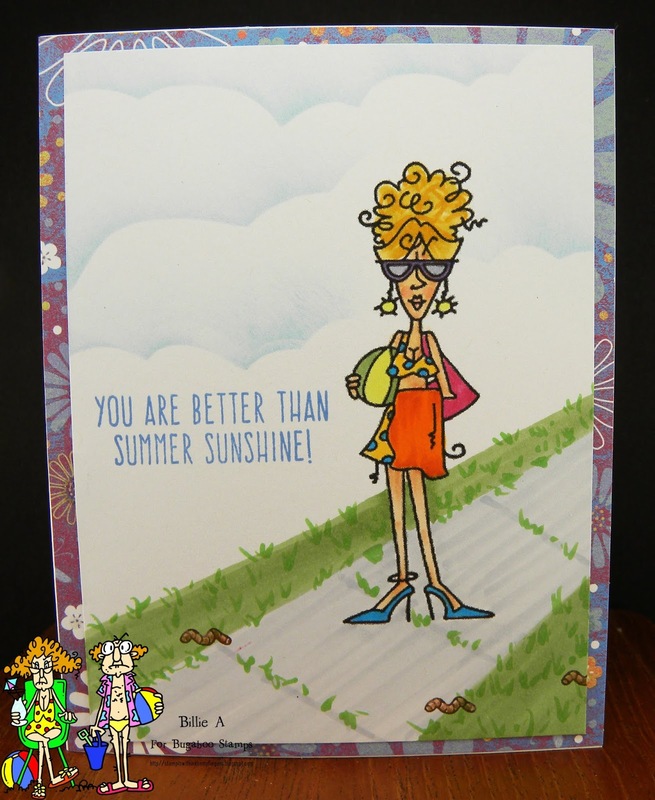 The new release is Beach Ruby... Well I have been doing beach scenes the last few weeks so figured it's time for Ruby to be heading down the road to the beach.. or she's on her way down her sidewalk to her car to drive to the beach.. I created the grass, sidewalk with copics. I added grass between the sidewalk cracks cause most sidewalks I see have them.. Must be our nice high humidity, rainy weather we have in Washington state.. LOL. When I thought of sidewalks and grass I thought of worms so I added a few Tech. Tuesday worms. LOL.. I then colored Beach Ruby with copics. 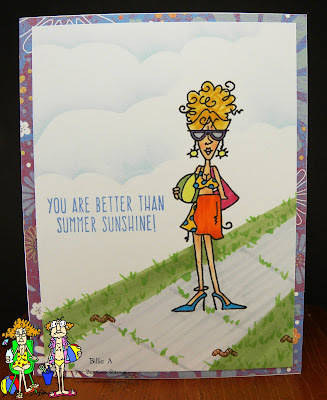 I created the clouds with my template and using Stampin up ink added the Simon Says sentiment... not sure why she's wearing high heels to the beach.. but hay I don't do and don't think I have ever done high heels.. I'm more a tennis shoe, birkenstock, ugg wearer.. Absolutely love this Billie. Love how creatively you added the pathway she is walking on and the clouds.